When completing any exterior staining project you can achieve the best results by using a quality product and having the right knowledge. 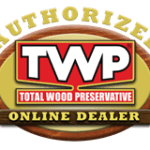 TWP wood stain will give you the best results possible but there are some general tips that can make the final results that much better. One vital step that a lot of homeowners skip over is wood prep. Preparing the wood for the new stain is extremely important. Skipping this step will not allow the TWP wood stain to perform as it should thus shortening its performance and longevity. For cleaning a wood surface prior to staining, we recommend Gemini Restore Kit with Wood Cleaner and Wood Brightener. This easy to use 2 step system is designed to free wood of dirt and grime and open the pores of the wood so the TWP stain will penetrate properly. Once the wood is cleaned, allow it to dry a minimum of 24-48 hours before staining with TWP stain. During the actual staining process keep in mind that you only need to apply as much stain as the wood will accept. Stain one board or section at a time before moving onto the next. This helps eliminate lap marks. Allow the stain to soak into the wood for 10-15 minutes then go back and back brush or wipe off any excess. If the stain has soaked in and the wood seems thirsty, you can apply a second “wet on wet” coat. But again go back and wipe off any excess drips, puddles, or runs that do not absorb after several minutes. Before taking on a TWP staining project be sure to check your local forecast. TWP wood and deck stain work best when applied in temperatures between 60-80 degrees. Rain should not be expected within 12 hours after it has been applied. It should not drop below freezing within 8 hours. Try not to apply TWP Wood Preservative in direct sunlight. It is not the best time to apply TWP during the mid-day heat and direct sun. This can cause the stain to flash dry giving a splotchy and uneven appearance. Try to plan your staining time during the morning, evening or whenever your deck seems shaded. 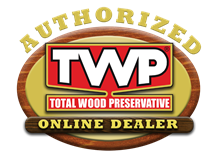 Achieving great results is easy with any of the TWP Series Wood Stain products. Follow these basic guidelines for staining with TWP and your wood surfaces will be greatly enhanced and protected for years of enjoyment. I applied TWP with a roller and back brushed it yesterday. I also I thought took off the excess by going over it with clean rollers. Today it is fairly shinny and tacky. Do I need to do anything else to the deck or just wait it out. BTW the deck was cleaned and brightened with Deck Restore. I stained my deck for the first time 16 months ago with TWP 100. I am ready to stain again using the same color.Do I need to use the Restore Kit and Brightner again or just clean it good. I completed staining my deck yesterday. Here in Michigan it was 68 degrees with a low temp of 48. Total is a high of 60. I have noticed today that on boards that abutted I have some lap marks and in those places there appears to be a bit of stickiness. My question is will this sticky area dry. The deck was properly cleaned last week. Thank you. Depends on your weather, etc. Typically it dries within 24 hours and can take people after 48 hours. Just make sure the stain is fully dried and cured. I plan to strip and brighten a previously finished doug fir deck with your RAD kit, wait 48 hrs, then apply TWP1530 wet-on-wet. How soon can this deck handle a bunch of people tromping all over it and probably spilling food & drink? Deck stain pads are easier, apply more evenly, and will push the stain into the wood grain. This article recommends cleaning with RAD wood cleaner and brightener, most of the other articles on this site recommend Gemini wood cleaner and brightener. Can you please explain the difference and which is recommended for which applications? The Gemini Restore A Deck Kit is what you want and is the same thing. Does all the old stain need to be removed? When it rains there doesn’t seem to be any beading anywhere. You need to remove as much as possible so the TWP will penetrate. I just stained my deck with TWP 100. 2 coats, wet on wet. How long should it dry before I replace all the deck furniture, plants and grill? Charles, give it a day or two for furniture. The response to Kristin applies to new cedar fence? Twp 1500? Kristin, TWP 1500 and about 200 sq. feet per gallon for one coat on newer wood. I am planning on staining the inside walls of a riding arena to protect the wood from dirt and the water that will spray on the walls from the sprinkling system. I have about 1650 Sq. Ft to cover. The walls are new, fir car decking. How many square feet can I realistically cover per 5 gallon bucket? Which of your products, the 100 or the 1500 will give me the best service in the long run?